Step up on the deck and into the back porch. 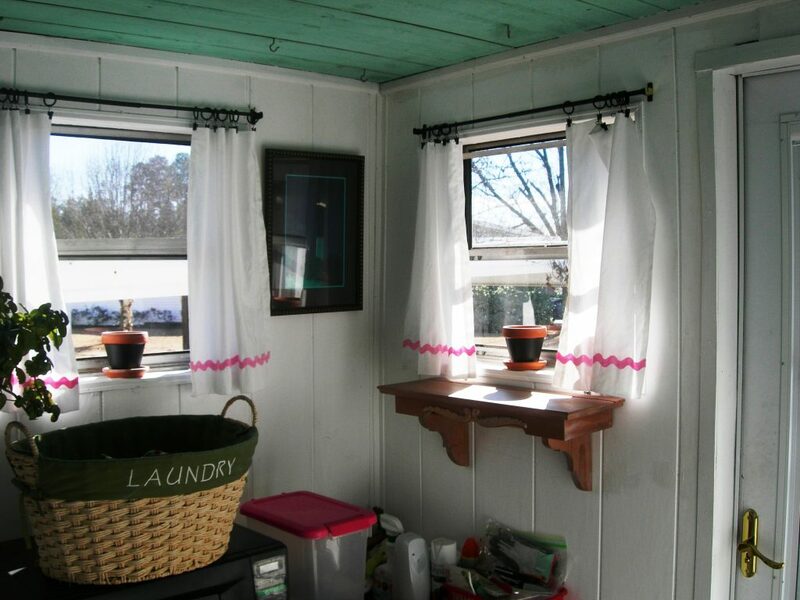 The back porch is also the laundry room, the pet food storage area, the greenhouse, and the home of the not so smelly litter box (I found some new litter!). Notice the ceiling color. Everyone said I should paint the ceiling, but I couldn’t cover that gorgeous color (vintage, faded turquoise). I already had that glass piece that we used in our other house. Here’s the back door. In this old house, I’ve learned to improvise. Yes, that really is a “baggie” taped over the cat door. As you enter the kitchen, your eye goes to this corner. I love my magnetic knife strip. It saves space and is so handy. Since I needed more drawer space in the kitchen, I painted the tall chest next to the stove. (It is really a lingerie chest that I’ve had since the 1970’s.) The curtains were made by moi! 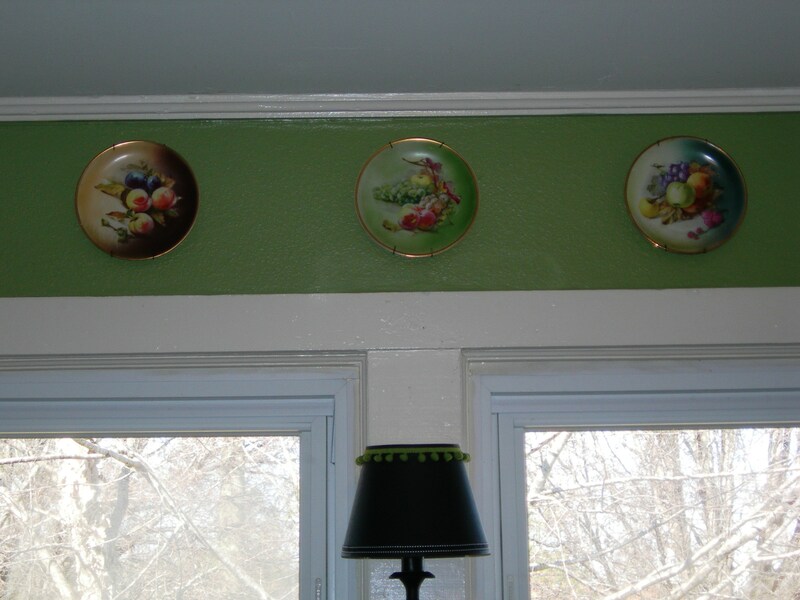 These plates belonged to my mother-in-law, and were displayed in her kitchen for a long time. I hung them back where they were originally. Here’s the area above the stove. Notice the magnetic spice containers on the refrigerator. The large butter mold belonged to my grandmother. This is the other corner of the kitchen. 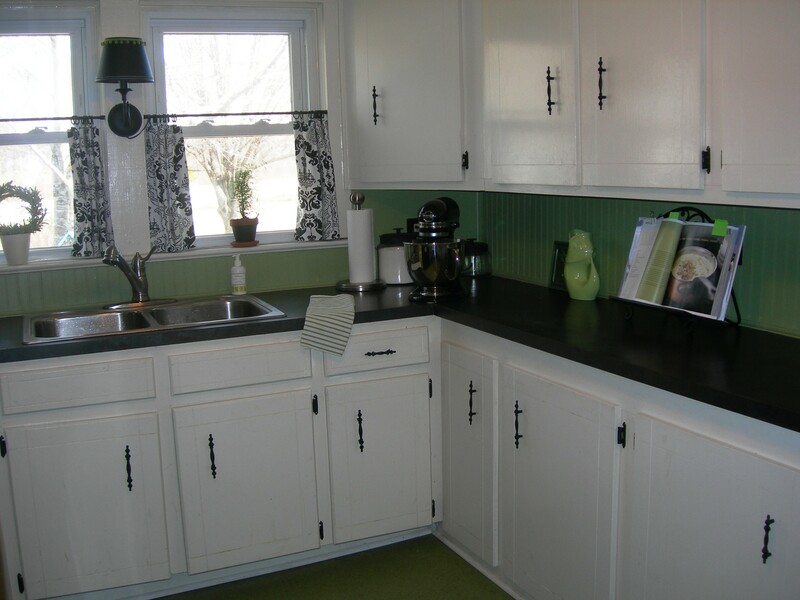 The cabinets are over 50 years old. They were painted inside and out with Valspar Oil-based Ultra White High Gloss paint before we moved in. We also put new laminate, beadboard, and cork floors in the kitchen. 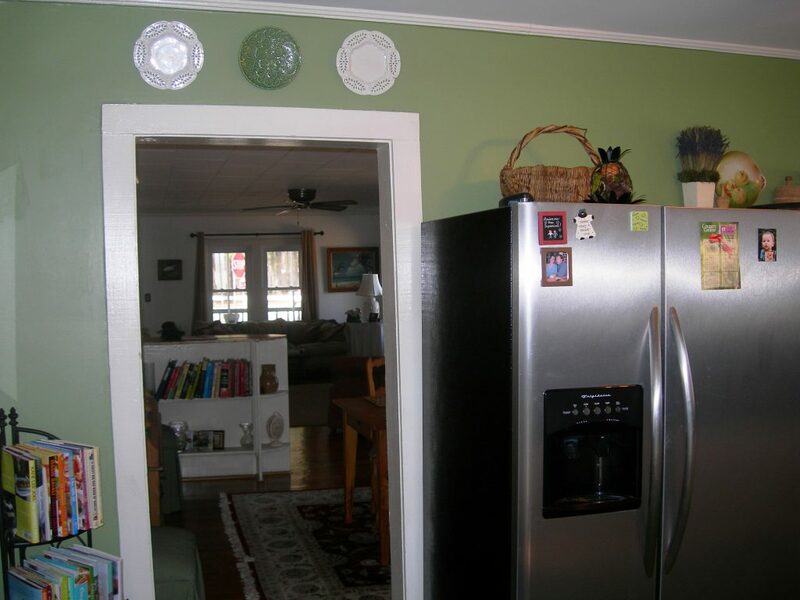 Sorry, I cannot find the name of the wall paint, but the odd thing was that we discovered that the kitchen had been painted almost the same shade of green at one point. Look at this sweet thing. This shot gives you a good view of Henry as well as the cork floor. In another corner are some of my cookbooks. I collect them and read them like novels. 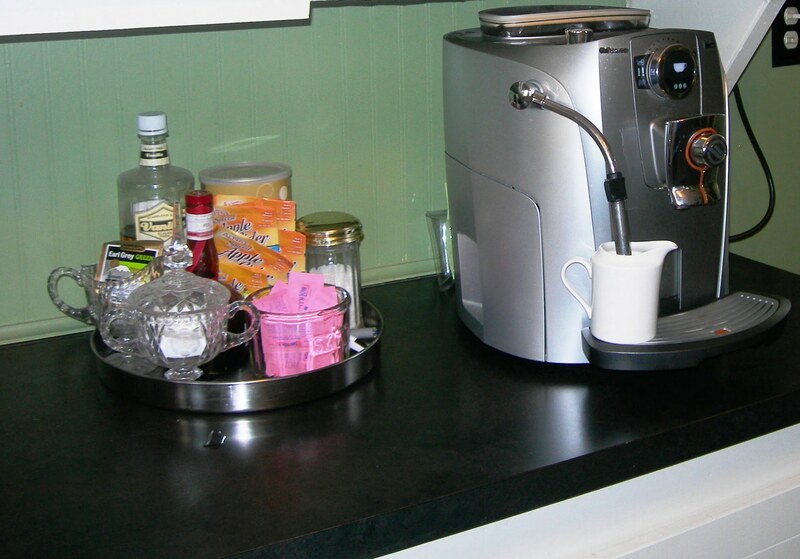 The most modern thing in our kitchen is our coffee machine. It’s a super automatic espresso machine. We could not live without it. Worth every penny. Here’s our chalkboard. I use it for seasonal displays as well as notes to myself. Big notes. From here you enter the dining room of our house, which I’ll show you another time. I hope you enjoyed your tour today. Did you spot something that our kitchen does not have? Oh my gosh!!! !I LOVE your website. I love riding by the crossroads everyday looking at the cottage to see what you have added and now I have this to look at. What awesome pictures of your home. It looks just like I imagined. I found your blog by seeing your comment on Debbie Doo’s space. I love your home! So warm and inviting and loads of history! I really love your kitchen and Henry is adorable! I can’t wait to see some of your garden photos this summer. I also really like the ceiling on your back porch. I wouldn’t have painted over that either. I’m a new follower. 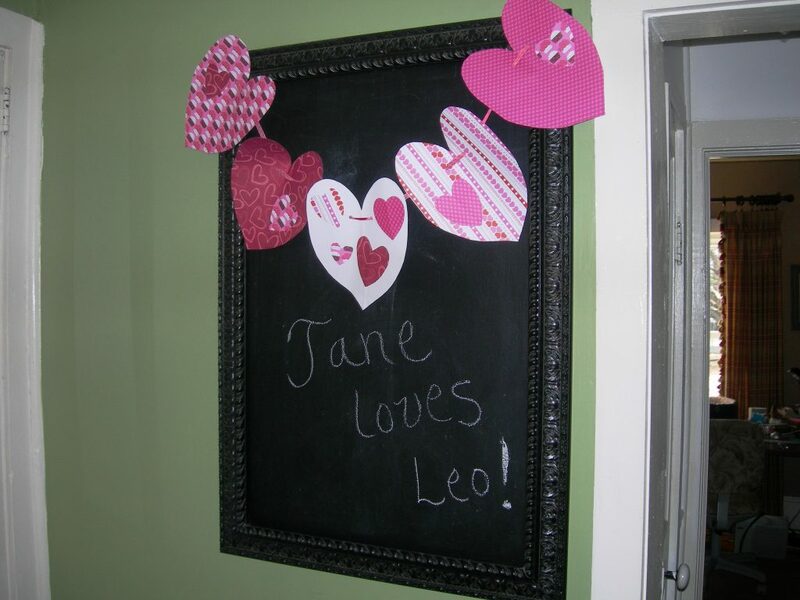 Jane love it! Green is my favorite color in a home. Great job for making small spaces look gorgeous! 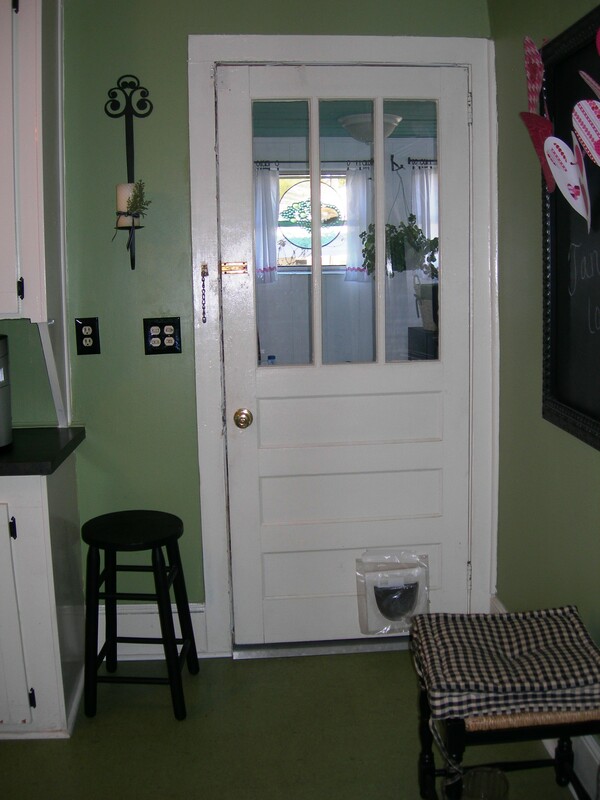 I’m a little late, but so glad I stumbled across your blog… cute kitchen!! I love the black and white, and the green adds just the right accent! Kitty Henry is the best accessory!! I’m so glad you stopped by as it led me to your wonderful blog. The kitchen is fantastic. I also have a the original kitchen in my 1964 home. We stained the wood a walnut color and changed the counters. I love all the green, it’s all so pretty! Why would anyone suggest you paint the porch ceiling?? That’s the BEST part. Love the color and the vintage feel it brings to the room. YUMMY! I love this kitchen~ It feels like home to me. I spotted that you do not have a dishwasher or a Microwave either? I think your kitchen is wonderful. I’ve got an old house– at one time it was a farmstead– belonging to a family that has lots of roots in these parts. Not our family. But if some one asks me where I live I say…in the Ol’ Tedder place and they say– which Tedder’s first, then we narrow it down from there! Ha! I’m sure we’re going to have a lot in common! Your kitchen is so pretty! I love that green paint…such a great color. 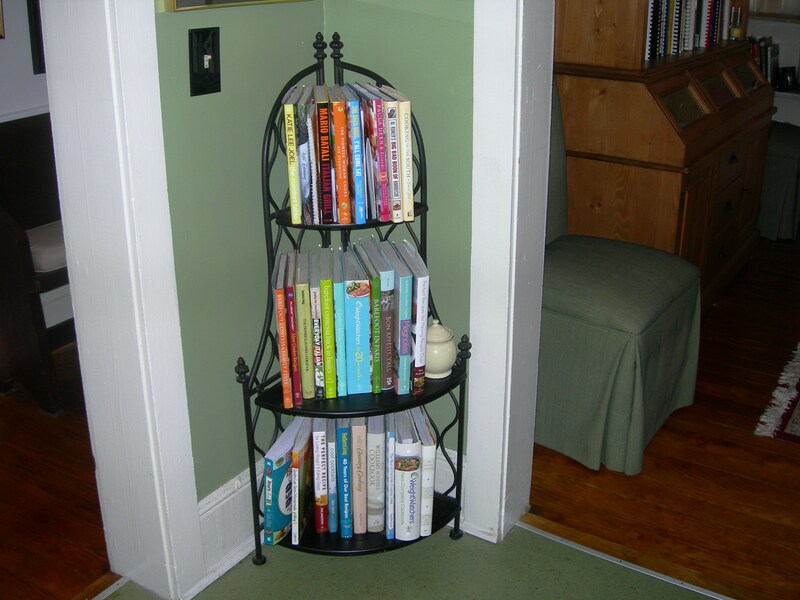 The beadboard backsplash is perfect & I, too, collect & read cookbooks like novels. Thanks for stopping by my blog today, I’m your newest follower. No dishwasher I do not have one either! Love it especially the CAT! love it! I especially LOVE the green ceiling. your home is just adorable! I love every corner. Do you not have a dishwasher? 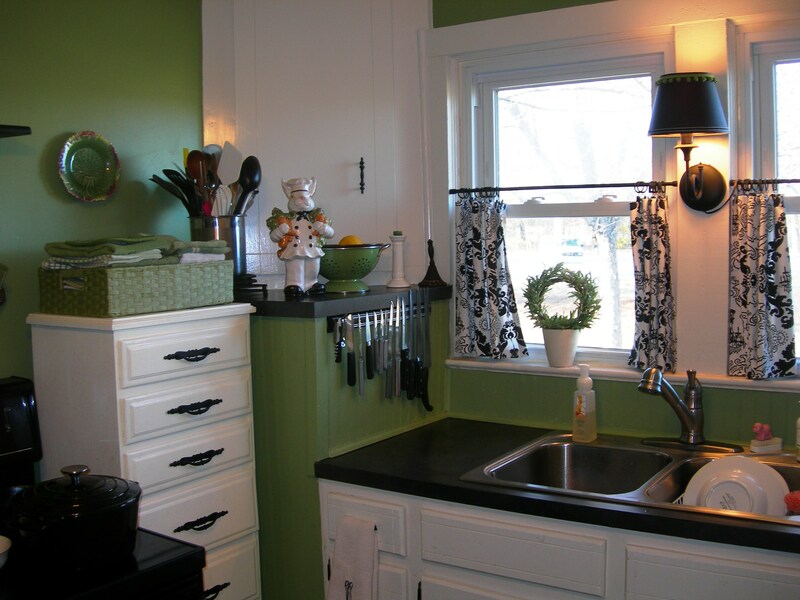 I love your black, white and green kitchen. I should have remembered that when you were helping me pick out fabric. Thanks for your help. You have so many great decorating ideas!!! I love your southern house. I am so glad I came across your blog. I look forward to the gardening posts. I want to come visit. haha. I am from the south and I have always dreamed of going back and finding a cottage to fix up. Love it!!!! Jane, I love your back porch and kitchen! The green is the same color that my mom had every room in the house painted when I was growing up! Of course, Henry is my favorite picture. 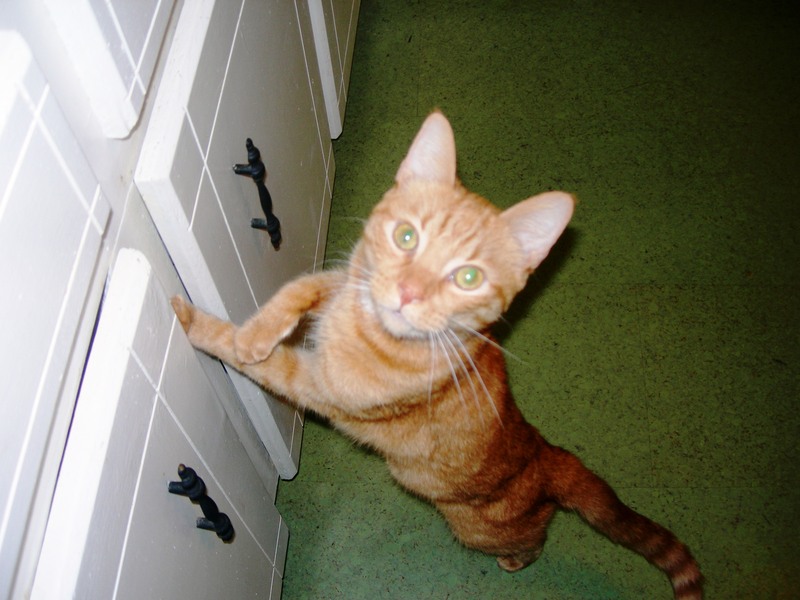 He’s purr-fect for a country house. I have so enjoyed looking at your pictures. 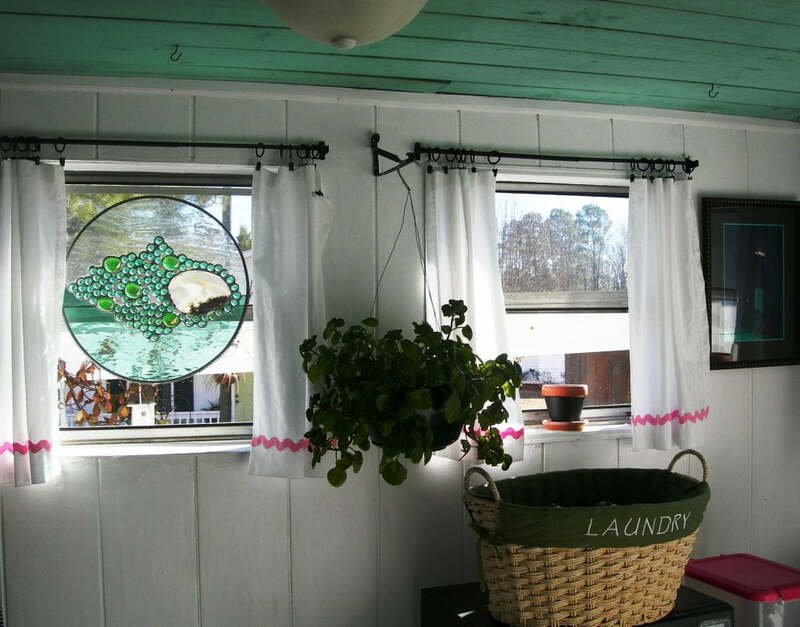 I have plates hanging in my house – wonder if that is an Oconee trait we share?! LOL! 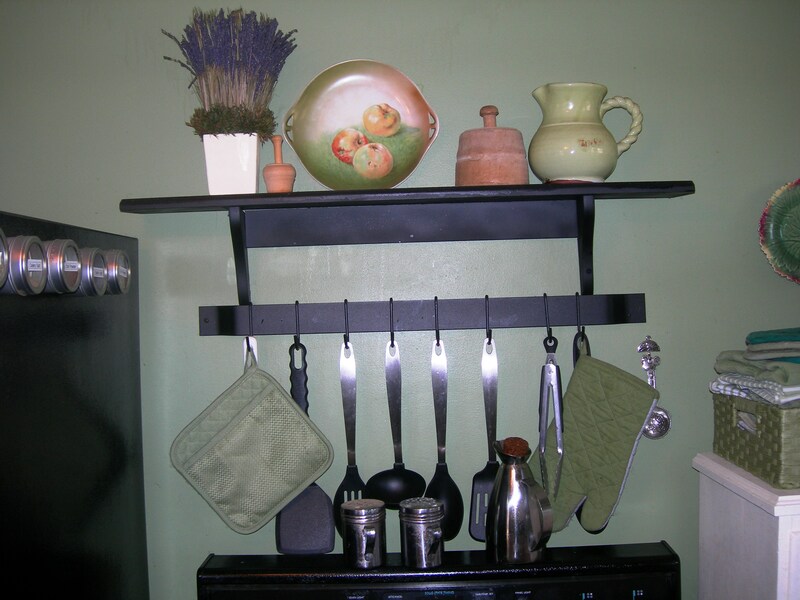 How clever you are to use the lingerie chest in your kitchen. I might have to borrow that idea. 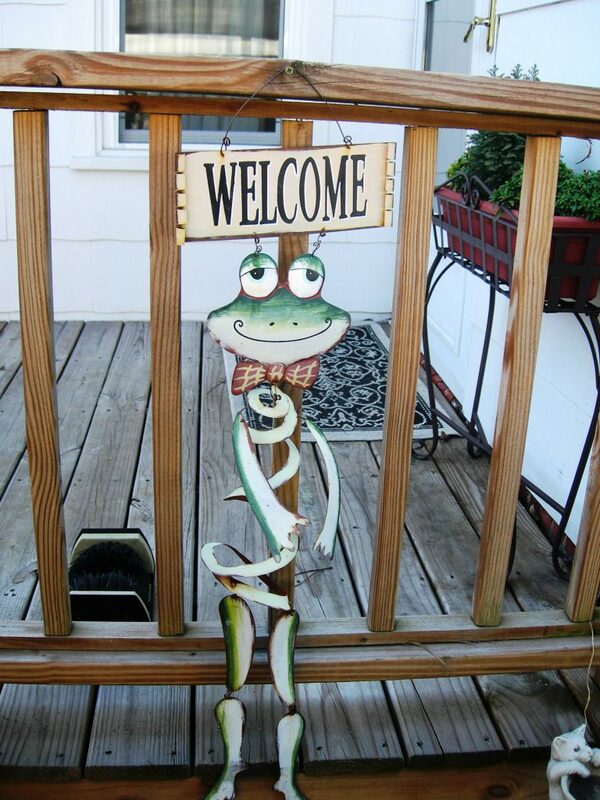 And, I love your magnetic spice containers, your frog welcome sign, the heart banner, just everything!! Thanks for sharing it with us!